I'm old, I'm fat, but I'm healthy! With the days growing decidedly more balmy, we decided to brush off the grill and do a little outdoor cooking. 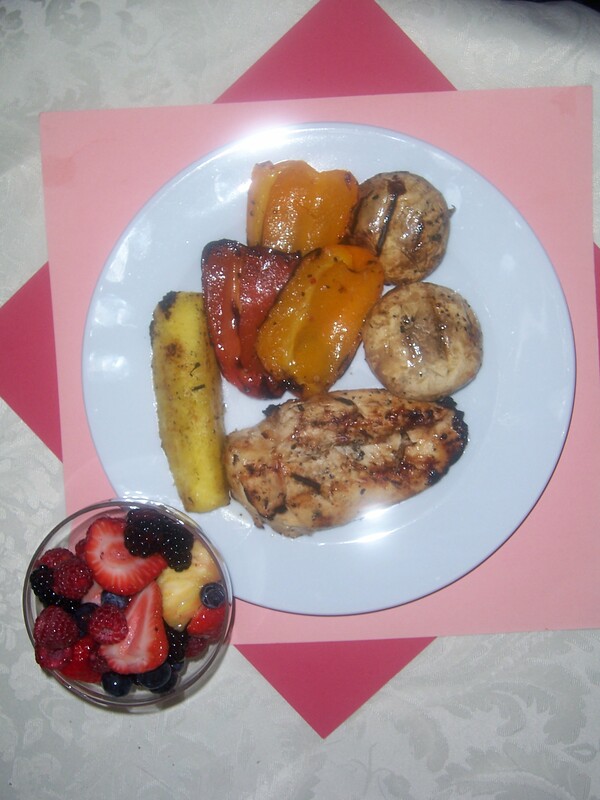 Today, we bring you barbecued Chicken, with peppers, mushrooms, and pineapple. If you haven’t used the grill for anything other than steaks before, you’re in for a treat. The barbecue really brings out unexpected flavors in your favorite produce. This assortment of smoked treats can be eaten separately, or put together in a kabob. We decided that a nice fruit salad would complement this dish nicely. Why not light up the grill, unfurl your picnic blanket and enjoy a Summertime Supper beneath the stars. If you’re going to do a marinade, you’ll want to let your veggies and meat sit overnight. 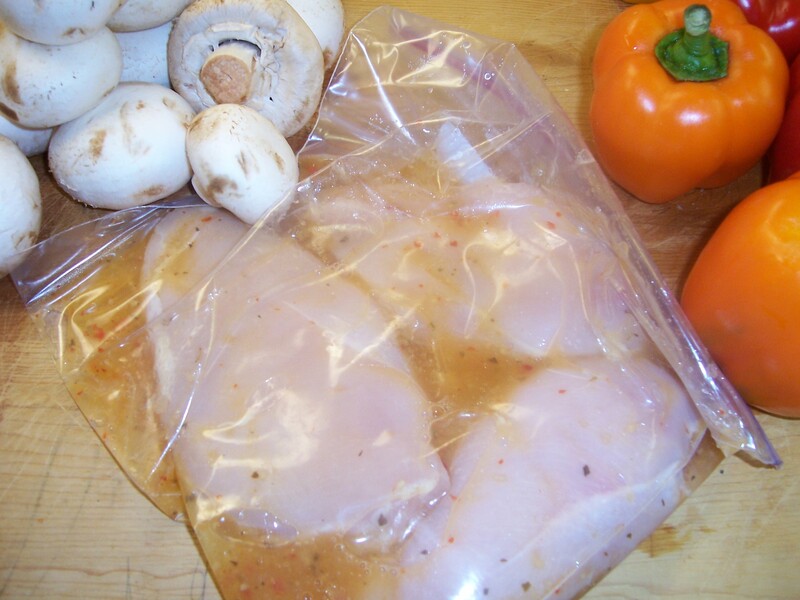 We placed our chicken in a ziplock bag with a covering of vinaigrette. Make sure to turn the meat so that both sides get a coating. 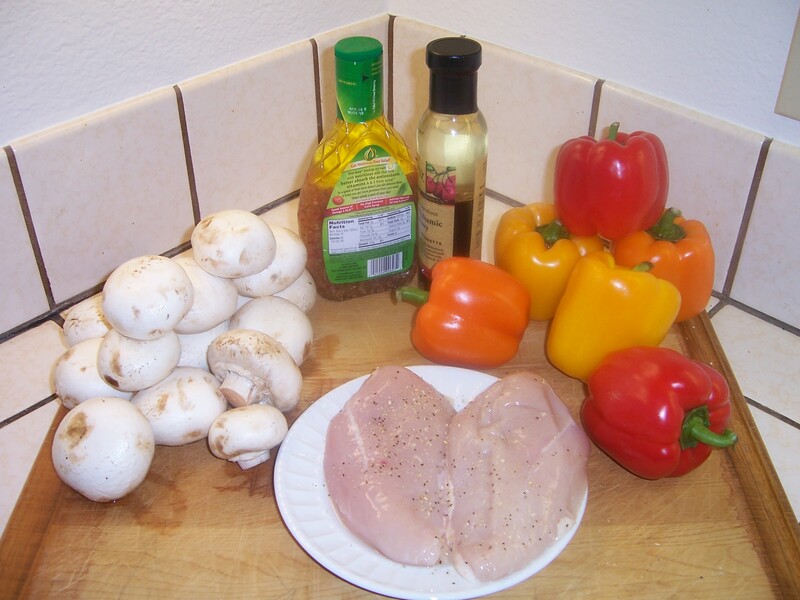 Do the same with your bell peppers, you will want to quarter them, and mushrooms, and let them sit overnight in the refrigerator. If you are using olive oil, you don’t need to let the veggies marinade, a spritz before grilling is all you’ll need. It should also be noted that pineapples do not require a marinade, the grilling creates a carmelization of the sugars on the outside and adding marinade can destroy this natural flavor. 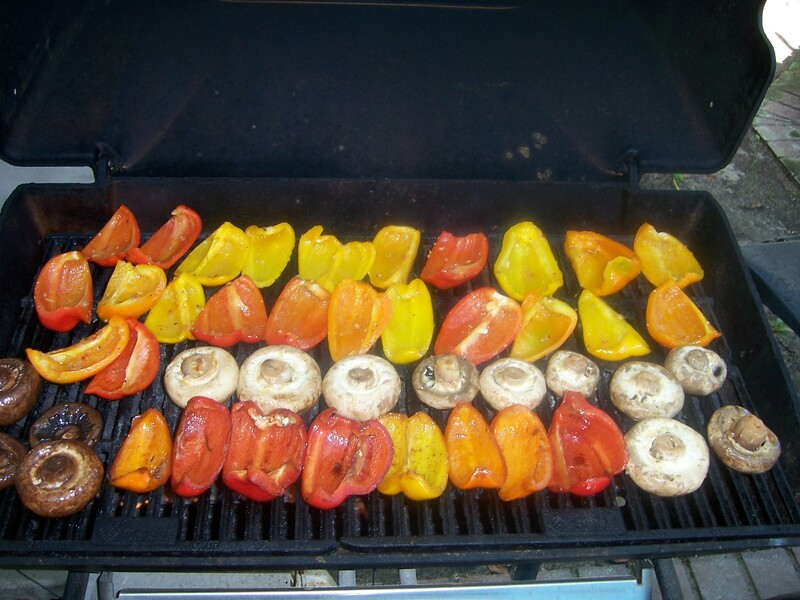 When your veggies and meat have been thoughrly saturated, take them out and get them ready for the grill. We prefer to do the bell peppers and mushrooms before the meat, so that they do not absorb any of the juices, which can alter their taste. If you have any vegetarians or vegans in your crew, they’ll also appreciate this consideration. Veggies are quick to brown so don’t leave them on two long. Give them a few minutes and flip them or you’ll have a batch of little charcoal chunks to offer your guests. When your veggies have thoughrly browned, remove them from the grill and set them on a plate. Our italian marinated veggies have a much lighter color, and a sweet salty flavor. If this isn’t your taste, try a balsamic vinaigrette for a lighter zest or olive oil to let the natural veggie flavors shine through. We chose to grill our pineapples and meat together. 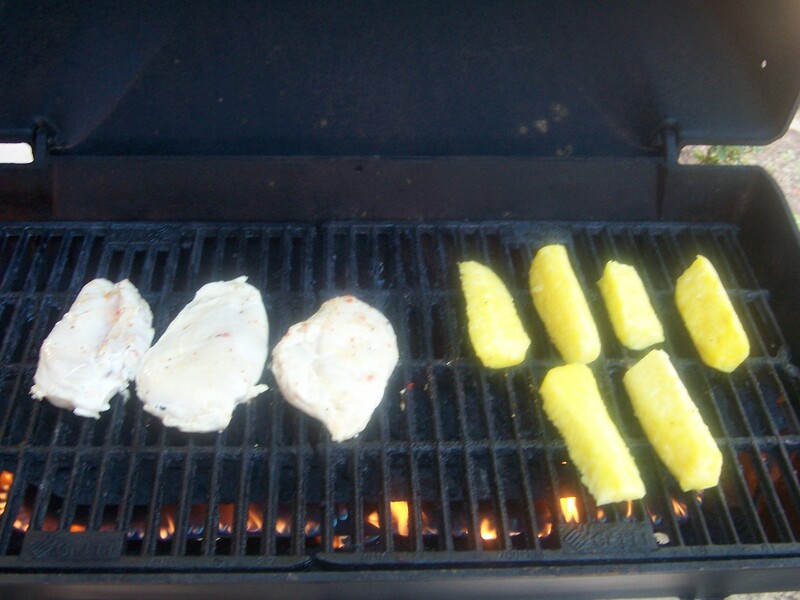 The pineapples take a little longer to grill because they are so moist. Keep turning them till you see bands of light browning on the outside, signifying carmelization has taken place. Cook your meat to taste, we like ours a bit well done. With chicken, this means cooking it until it trades in its rosy hue for a nice crisp white with dark bandings of color from grilling. Take your meat and set it aside. 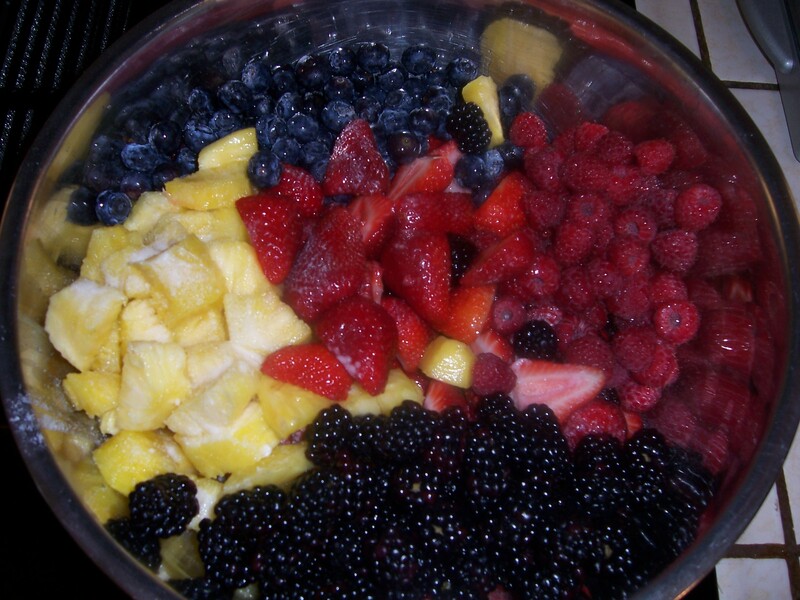 Now it’s time for the fruit salad. This is an extremely simple dish. Start off by hulling and slicing your strawberries. 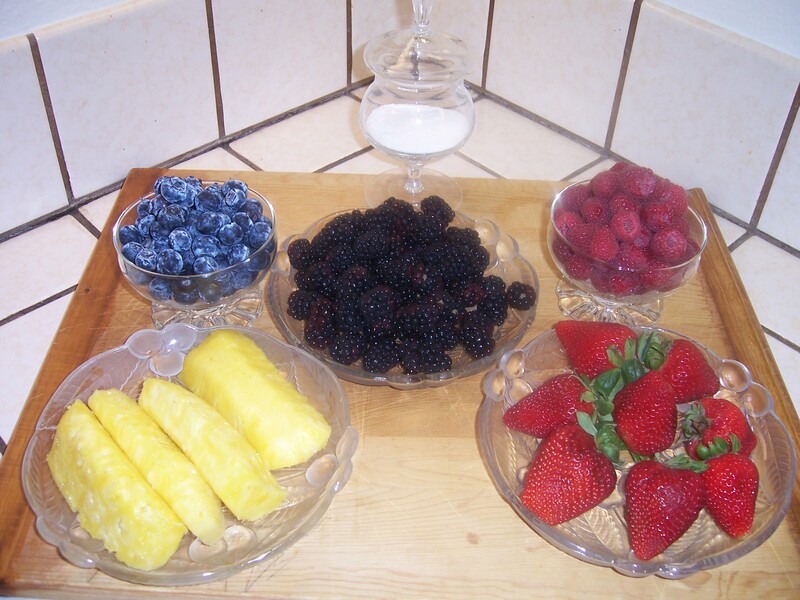 Place the prepared berries in a bowl and sprinkle with sweetener. We use sweetener with our berries as they tend to be a little tart. Next slice your pineapples into one inch chunks, now add them to the bowl. Plop in your raspberries, blueberries and blackberries. Sprinkle with a bit of sweetener and toss. Place your meat and veggies on a plate, you may want to offer kabob sticks, but this can be enjoyed as a stand-alone meal. 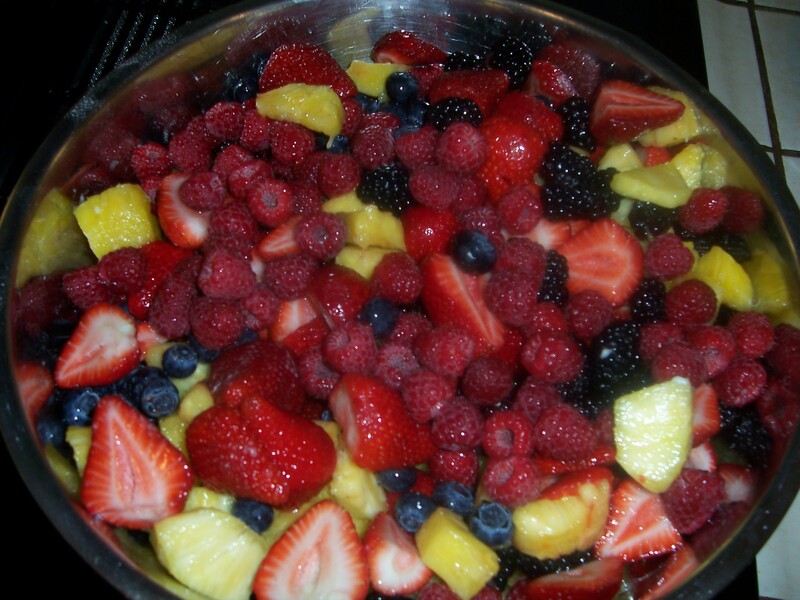 Serve your fruit salad in a separate dish to preserve the flavors and enjoy! Now you’re ready for a Summer feast! This entry was posted in Barbecue. Bookmark the permalink.